Alicia Barnett follows through on a serve. The junior is the team’s No. 1 in singles, and has won three of her last four matches from the spot. The Wildcats look to continue their winning streak against conference competition this weekend, this time trying their hands on the road. After coming off a 1-1 weekend against non-conference foes Baylor and Texas, No. 28 Northwestern (4-3, 1-0 Big Ten) turns its attention back to the Big Ten as the team faces opponents No. 22 Ohio State (6-4, 0-0) and No. 42 Indiana (9-2, 0-0) on Friday and Saturday, respectively. The Cats have been on a roll since their rough beginning at 1-2, winning three of their last four matches — two of them against Big Ten opponents Penn State and Purdue. Ohio State is traditionally a tough opponent for NU. Despite the high-scoring wins of the Cats, the Buckeyes keep things competitive. With head coach Claire Pollard taking her second leave of absence of the season, Gurden will be leading the charge again. Last time Gurden took the reins, NU came out with its wins over the Nittany Lions and Boilermakers. In a similar situation, this weekend Ohio State counts toward the conference record while Indiana does not. After turning around a tough loss against Baylor into a dominant win over Texas, the Cats know they have to bring their A-game against the Buckeyes and Hoosiers. Something in particular NU needs to improve coming into the weekend is the doubles point. The Cats have lost the doubles point three times, and they fell in all of these matches. 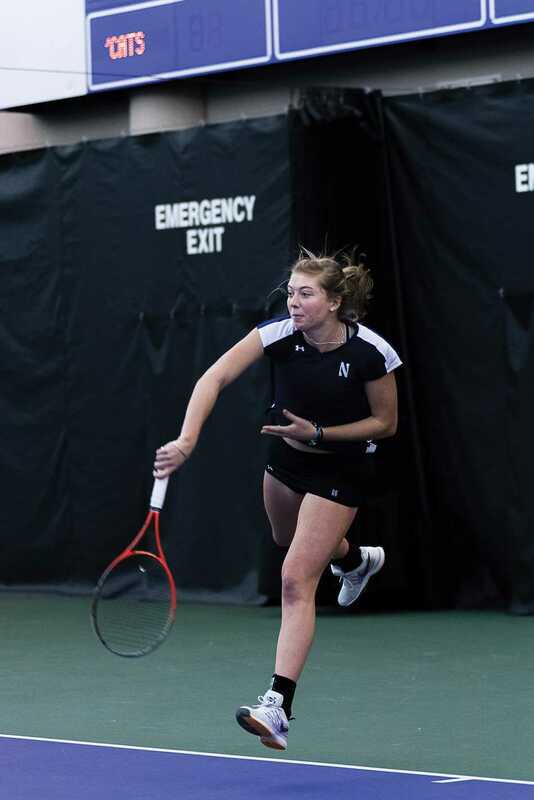 Other than working on doubles, NU developed and prepared their individual games after the weekend. On the individual level, the Cats still have room to grow because of the youth of the team. The young squad is still searching for a way to execute at the highest level. After this mid-season finale against Ohio State and Indiana, NU will have an idea of where it stands as one. As the quarter winds down, the Cats are in full swing and will have to use their spring break to prepare for the gauntlet that is the rest of the Big Ten, starting with Illinois on March 20.